Proper identification of all sales are an important element of a company's income statement. Which Accounting Revenue Cycle Procedures should you utilize? The proper identification and acceptance of all sales are an important element of internal control for a company’s income statement. It represents the primary source of most companies operational cash flow and therefore needs to be protected, managed and monitored using financial internal controls. The following Accounting Revenue Cycle Procedures should be utilized to account for and recognize all sales income of the company. The revenue cycle starts when you begin taking the order and is not complete until your company receives payment AND pass the point of no returns. Use these sample accounting revenue cycle procedures to ensure efficiency and success in your accounting department. 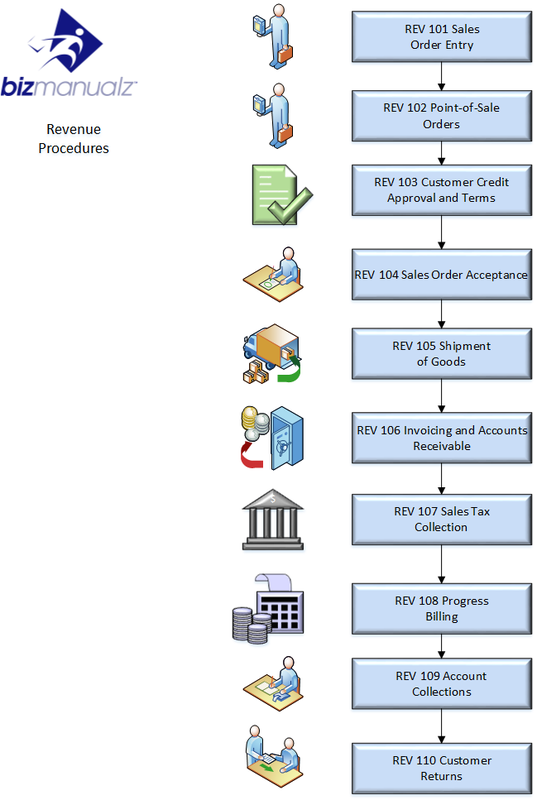 The first accounting revenue cycle procedure you should utilize deals with your sales order. All customer orders will be processed in an efficient and organized manner to ensure accurate and prompt shipments. The company should summarize the preparation of documents, paperwork flow, and responsibilities by individuals and departments for obtaining a sales order from a customer through shipping and billing the customer. Each individual involved in the sales order process should take the responsibility to determine that all required and necessary activities and documents are properly completed. This applies to all individuals and departments involved in consummation of the sales process, specifically including Sales, Customer Service, Credit, Manufacturing and Billing. The Company should provide POS Point-Of-Sales procedures for ensuring that all sales are proper and collectible and the effect on inventory and cash is posted correctly. There should be proper transaction controls over sales and proper reviews and authorizations by the store manager. This applies to all cashiers and cash handlers. To reduce potential collection problems, new customer accounts or credit limit increases will be properly evaluated and approved prior to extending credit. The company should outline the activities and responsibilities involved in obtaining credit approval for a potential customer before sales orders are consummated. These credit procedures are to be followed for all credit approvals requested by the Sales or Customer Service Departments for customers interested in open account, lease or rental financing. To ensure the highest customer services levels and reduce potential order problems, sales orders will be properly evaluated and approved prior to entry into the accounting system and fulfillment by the company. The company should outline the activities and responsibilities involved in verifying the acceptability of all sales orders received before they are consummated. This applies all sales orders taken by the Sales or Customer Service Departments. All products and services should be delivered in an organized manner in order to maintain the highest customer service quality levels possible and to ensure compliance with all United States Customs laws and regulations when exporting goods & services. The company should outline the steps for the packaging, safe storage, control and delivery of all products and services shipped by the company. This applies to all products and services distributed by the company, sales, customer service and shipping personnel. Accounting is responsible for the timely preparation and distribution of invoices to optimize cash flow and customer payments. Accounting should also maintain accurate records over Accounts Receivable and abide by proper internal controls. The company should explain the methods for the preparation of invoices and accounts receivable records processing. This applies to all product sales and services provided by the company. The company is liable for collecting sales tax anytime there is selling or renting of tangible personal property through a retail sale, subject to certain exemptions and conditions, within a jurisdiction in which the company is deemed to be engaged in business. The Company will at all times comply with all state and local sales tax regulations and requirements. The Company should outline the sales tax rules, rates and exemptions for the collection of sales tax on sales and service by the company. This applies to individuals in Sales and Customer Service who are directly responsible for the sale of products. Progress billings will be made to clients on a timely basis throughout the life of the project. These billings will be accurate and easily understood by both parties involved. The purpose for creating progress billing is to obtain payment for the portion of labor and materials used up to a certain point in time and before the project is fully completed. This improves the cash flow typical of long-term projects or assignments. This procedure applies to all service agreements or projects provided by the company. All open accounts receivable with late or delinquent payment activity will be handled in a timely and effective manner to ensure maximum account collections and an optimum accounts receivable turnover ratio. The company should provide the actions and methods for processing late or delinquent payments. This applies to the Credit Department involved with collection of past due accounts receivable. The Sales and/or Shipping Departments may be involved in reference to shipping holds or special credit arrangements. Te last revenue cycle procedure your company should make sure to have is the customer returns procedure. The company should outline the steps and documents to be used for customers returning goods in order to provide adequate control of inventory and timely refunds to customers. This applies to all products and service parts sold by the company. Common risks associated with the revenue cycle include the authorization or accuracy of sales contracts with clients. You must ensure prices are quoted correctly following your sales pricing policy. You don’t want sales orders to be accepted without management’s knowledge or to be accepted at prices or terms that violate governmental laws and regulations. You must review how credit is extended to customers who represent unacceptable credit risks to the company. When you provide services or ship product, you must ensure that your goods are not delivered to the wrong party, or the wrong quantity of goods or services may be shipped or delivered. A common embezzlement scheme is to use fictitious or otherwise invalid shipments or services. That is if the goods are correctly billed in the first place. It’s possible that products are sold or but may not be initially recorded and reported. Records of sales may be lost and therefore not billed for. How Collectible Are Your Accounts Receivable? An ineffective collection of receivables from your customers is a constant risk to any business that accepts purchase orders, especially to the revenue cycle. Of course relying on cash receipts is not necessarily the answer either. Employees may not record your cash receipts. Your bookkeepers may not apply your cash receipts to the correct subsidiary ledger. Accounting Revenue Cycle Procedures are an important element of internal control to ensure that your company’s income statement is accurate. Your primary source of operational cash flow is from your sales revenue and therefore needs to be protected, managed and monitored using industry best practices for financial internal controls. Download Free Sample Accounting Procedure Templates to see how easy it is to edit MS Word Templates to build your own policy and procedure management system with financial internal controls. What Are Cash Cycle Procedures? What Are Common Accounting Methods?